The best NRL Preview on the net is back online with all the info you need to make an 'informed decision' in your Fantasy and Tipping Competitions. Make sure you bookmark www.wdnicolson.com and compare your picks to the Podcast Panel's Tips every week. Download the Podcast and check back on Friday for the Latest Mail as it breaks. Note: The order in which Special Fried Rice (the game we guarantee that team will win) is chosen rotates - this week Matt had 1st choice, Dave 2nd, Nic 3rd and Waz 4th. So it isn't as easy as it sounds to tip correctly each week. 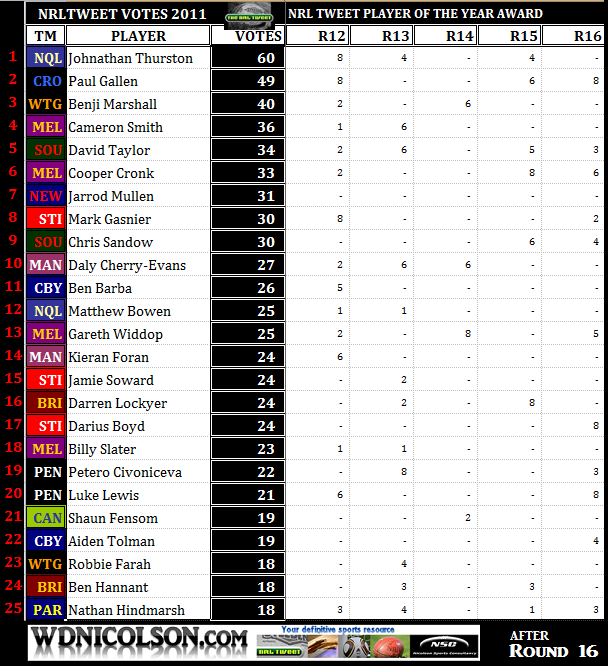 You can check out who the NOT The Footy Show Experts picked for the 2011 Premiership via this link. NOT The Footy Show Podcast is available every Thursday - subscribe now on iTunes so you don't miss out. Welcome to Season 2011... after an off-season that often feels longer (or shorter - depends if you like cricket or not) than it is - the footy is back. Here on www.wdnicolson.com we've got all the Tuesday Team News, Wednesday or Thursday Previews and Friday Late Mail (sourced from SMH and beyond) that will keep your Tipping and Fantasy habit well fed. This preview integrates our NRL Injured List - which if you haven't bookmarked by now - I suggest you do so. 7:45pm (Local) 1 July @ Parramatta Stadium, Parramatta. 13th EELS TEAM RECORD 4-9-1 for 13 Points, -103. 5th BRONCOS AWAY TEAM RECORD 10-5 for 22 Points, +46. EELS 5 BRONCOS 5 - Parramatta won their last clash 30-14 in Round 23 last year, while the Broncos have won 3 of the last 5. PAR: Burt, Uaisele, Walker, Loko, Atkins, McGuire, Robson, Allgood, Keating, MoiMoi, Hindmarsh (c), Lasalo, Smith. Bench: Shackleton, Manuokafoa, Webb, Horo, Maitua. BRI: Hoffman, Copley, Reed, Beale, Gagai, Norman), Wallace, Kenny, Baptiste, Anderson, Glenn (c), Lui, Gillett. Bench: McCullough, Hunt, Dodds, Hala. Check out the Video Preview or the Podcast - this text is updated Thursday Night with whatever has been said in the Video or Podcast. SMH and Other Late Mail 1/07 - The Broncos have announced that Josh McGuire will travel with the squad named on Tuesday and is likely to play after overcoming an eye injury - Kurt Baptiste is out with a shoulder injury. Jeff Robson is rumoured to have twinged a hammy at training and is in doubt for Parramatta (strong mail late Friday that he is OUT), while Jacob Loko (foot) and Shane Shackleton (hammy) are also in doubt. Reni Maitua is expected to make his return to the NRL after a few years out serving a drug ban. EELS To Win By 10 Points. ET's Rugby League Returns! + Petero's Try of the Year + Origin 3 Team Analysis + Transformers gets the Culture treatment + Round 17 Preview as it went LIVE on UStream! As per usual we talk all things 2011 NRL Premiership and give you our much anticipated Special Fried Rice selections. Look forward to mildly entertaining you in 2011 - The NOT The Footy Show Team. NOT The Footy Show Episode 70 - June 30, 2011. For more Rugby League Coverage check out wdnicolson.com, The NRL Tweet on Twitter or NOT The Footy Show on Facebook. Subscribe to the podcast via http://itunes.apple.com/au/podcast/not-the-footy-show-2010-nrl/id370905391 or watch our Videos on YouTube. If you're not watching NOT The Footy Show Live from this page then you can stream it here. NOT The Footy Show goes live at 8:20-8:25pm Wednesday June 29, 2011 - for our 70th Episode and the Round 17 NRL Preview. 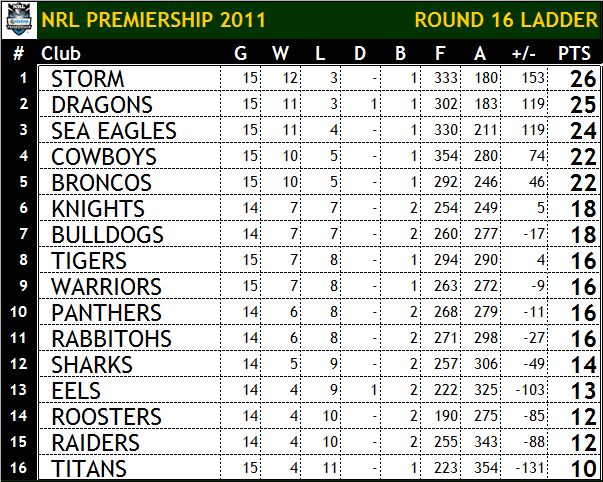 As released on Tuesday June 28 - Each NRL Team for Round 17 is listed below. All Teams have been analysed in comparison to the side they last put on the field. PEN: Coote, Simmons, Vaivai, Tighe, Purtell, Burns, Walsh, McKendry, Kingston, Grant, Waterhouse (c), Plum, Smith. Bench: Seluini, Weston, Bell, Fatiaki, Walker, Seijka. CBY: Barba, Turner, Idris, Morris, Wright, Keating, Hodkinson, Tolman, Halatau, Hodgson, Pritchard, Ryan (c), Stagg. Bench: Kasiano, Eastwood, Payne, Roberts. CRO: Gardner, M Wright, Pomeroy, Best, Stapleton, Graham, Townsend, Snowden, Morris, Douglas, Bukuya, Tupou, Smith. Bench: Mannah, Tagataese, Flanagan, Tautai. SOU: Wesser, Merritt, Farrell, Corrigan, Roberts, Sutton, Sandow, Ross, Luke, McPherson, McQueen, Pettybourne, Crocker (c). Bench: L Burgess, Tyrrell, Clark, Peats. STI: Nightingale, Tagive, McKinnon, Stanley, Simmonds, Fien, Hornby (c), Hunt, Young, Weyman, Cuthbertson, Greenfield, Prior. Bench: Green, Rein, De Belin, Gower, Bosden, Marketo. NEW: W Naiqama (c), McManus, Sa'u, Lulia, Mata'utia, Roberts, Stig, Fa'aoso, De Gois, Tuimavave, Houston, Edwards, Southern. Bench: Hilder, Kaufusi, Ciraldo, Tolar, Karawana. SYD: Khierallah, Perrett, J Carney, Kenny-Dowall, Leilua, Anasta (c), T Carney, Ryles, Friend, , Waerea-Hargreaves, Symonds, Takairangi, Guerraa. Bench: Waerea-Hargreaves, Masoe, Guerra, Symonds. CAN: Massey, Ferguson, Croker, Thompson, Robinson, McCrone, Williams, White, Tongue (c), Learoyd-Lahrs, Picker, Papalii, Fensom. Bench: Buttriss, Harrison, Tilse, Thurling, Miller.